This is an 8" action figure of Capt. 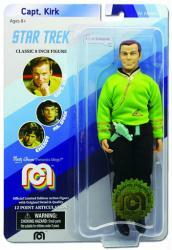 Kirk in Green Shirt from the classic TV series Star Trek and the TV Favorites line of MEGO classic style action figures. Kirk is wearing the green uniform shirt that he can be seen wearing in the classic Star Trek episodes "The Trouble with Tribbles," "The Enemy Within," and "I, Mudd." This Limited Edition action figure is one of only 10,000 produced by MEGO Corp. in 2018. The figure remains new and sealed in its original VERY GOOD-conditioned packaging. The packaging's backing card has a small, light creasing in its surface.